The steel Tomahawk snare model is included as standard with the purchase of every Armory Series drum set, although it can be traded-in for any of the four other models, giving an extra level of personal choice to the player. Armory Snares are great additions to any player's arsenal or for your main weapon of choice. "Each of The Armory Series snare drums were designed with the influence of pros and have their own personalities" states Mike Robinson, Mapex Director of Marketing. "Personally, I've had a hard time deciding which one is my favorite as they all have their own unique musical voice." Tomahawk - The 14" x 5.5" 1mm Black Plated Steel shell has penetrating accuracy and long range projection. The focused power of its rimshot is devastating. Daisycutter - With its 14" x 6.5" 1mm hammered steel shell; The DAISY CUTTER is a cannon that will rattle the walls. It's a high caliber drum that can be heard for miles around with its explosive sound. Dillinger - It's fast, articulate, and responsive, THE DILLINGER will handle the most intense of musical assaults. 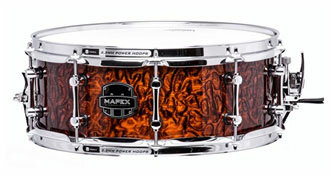 The 14" x 5.5" 8-ply Maple Shell will open up with just a flick of the finger.